Dame Maggie Teyte was born on April 17, 1888, in Wolfverhampton, England. After studies at home, she went to Paris, where she became a pupil of the celebrated tenor Jean de Reszke who had given up his career in 1900 to teach. 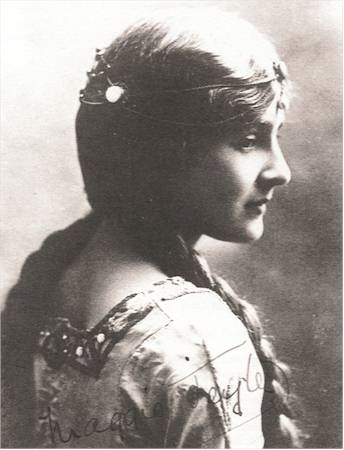 In March 1906, she made her debut in a series of Mozart concerts conducted by Reynaldo Hahn and in 1907 became a member of the Paris Opéra-Comique. 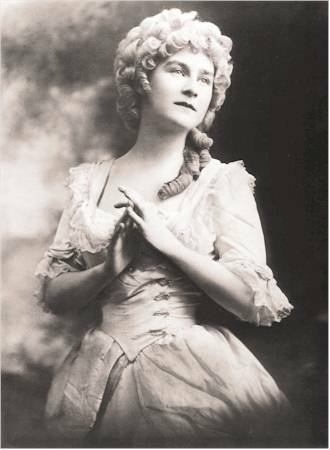 After a few small parts, she was cast as Mélisande, replacing the celebrated originator of the role, Mary Garden . To prepare for Pelléas et Mélisande, Teyte was sent to study with Debussy himself, every day for six months! By reputation he was a terror and a martinet, but according to Teyte, he rarely corrected her; in fact he hardly spoke to her at all (!). “It was Bonjour, Monsieur Debussy and Bonsoir, Monsieur Debussy,” she later recalled. Clearly he appreciated her talents, both the natural beauty of her voice and her instinctive interpretation of his music. 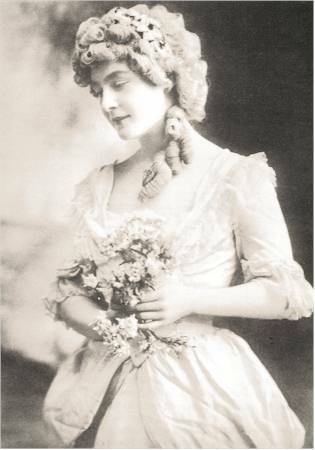 In 1910, she conquered London audiences with her portrayals of Cherubino in Marriage of Figaro, Blonde in Abduction from the Seraglio, and Mélisande, all under the baton of Sir Thomas Beecham. When Sir Paolo Tosti was asked his impression of the young soprano, he replied, ”she is the only singer today who can sing.” Rare praise in an era when Melba and Caruso were still in their prime! 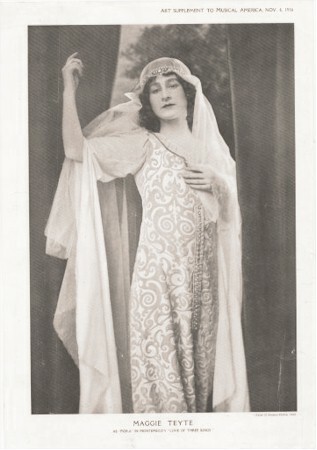 Despite her early successes, Teyte had a difficult time finding a place for herself in the main opera houses of the world. She developed a following in Chicago, Boston, and Philadelphia, and sang in America through the end of Worldwar I, but did not appear in New York. She married in 1921 and went into a period of semi-retirement. 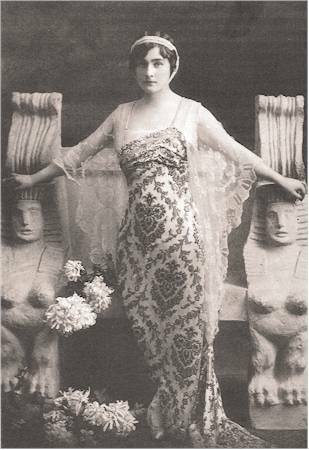 Upon the disruption of her marriage in the early 1930s, Teyte faced difficulties of resuming her career after an absence of nearly a decade. An Australian tour was a financial fiasco. Twice she attempted an American comeback, but managers, though kind and sympathetic, were reluctant to hire her. It seemed that the public had forgotten her. At some point in the mid-thirties, it was proposed that Maggie Teyte sing Salome with the Royal Opera, Covent Garden. The project never became a reality, but Teyte privately recorded four excerpts from the opera with the noted pianist George Reeves at the keyboard. Judging by these recordings, Teyte would have made a formidable Salome, perhaps the closest to Strauss’ ideal (the composer’s unrealized fantasy was to hear the slender-voiced Elisabeth Schumann in the title role). Maggie Teyte’s career was received in 1936 by a set of recordings she made for EMI of Debussy songs accompanied by Alfred Cortot. 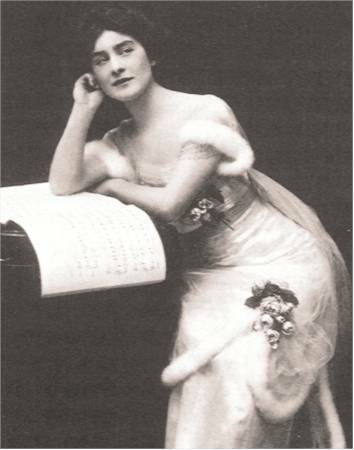 Though the outbreak of the Second World War interrupted the progress of her “second career,” her recordings established her reputation in England an the United States as the leading French art singer of her time. In 1948, she made her first New York appearances: a Town Hall recital [...] followed by a series of performances of Pelléas at the City Center Opera. 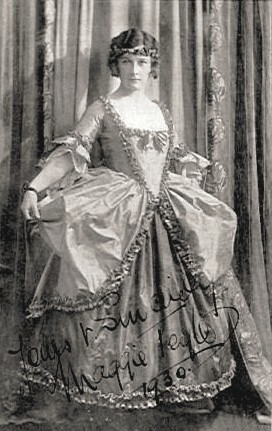 Teyte continued performing in opera until 1951 and on the concert stage until her retirement in 1955 (at age 67). In 1958 she was made a Dame Commander of the Order of the British Empire. She died in London on May 26, 1976. Unfortunately, we have too few recordings of this superb singer. Most of her recordings were made when she was over 50 years old. What a loss that such a voice and interpreter was not captured on record at the previous decade. Her voice is of exquisite purity, perfect placement, there is spontaneity and distinction. Hers is a voice of a “femme fragile,” perfectly adapted for French mélodies. She had a conscientious and painstaking approach to the art of interpretation. There was hardly a bar of music not heavily scored: vowel sounds, dynamic and expressive nuances, all were noted, and vertical pencil lines devided each bar into beats, so that every of the groupings of short time-values was exact and also exactly in place. Maggie Teyte’s recordings are indispensable for lovers of French music.